« GTF strike ends in 9th day. GPA boilers relit. Educative production and admins bowl-game junket plans resume immediately. LCNI predicts neural activity to reach normal levels by noon. I encourage faculty to show up at the full Board meeting, 8 AM Thursday, to support the guest speakers supporting faculty governance. I’ll do my best to live-blog it. 12/10/2014: Some erratic live-blog reports below, in the committee agendas. It’s rough, I’ll try and clean it up later. – Helena Schlegel has been confirmed by the state Senate as new UO student Board Trustee. – UO’s financial position is still strong, independent auditor gives “clean audit”. – ASUO and Lamar Wise get the board to amend tuition and fee setting policy. 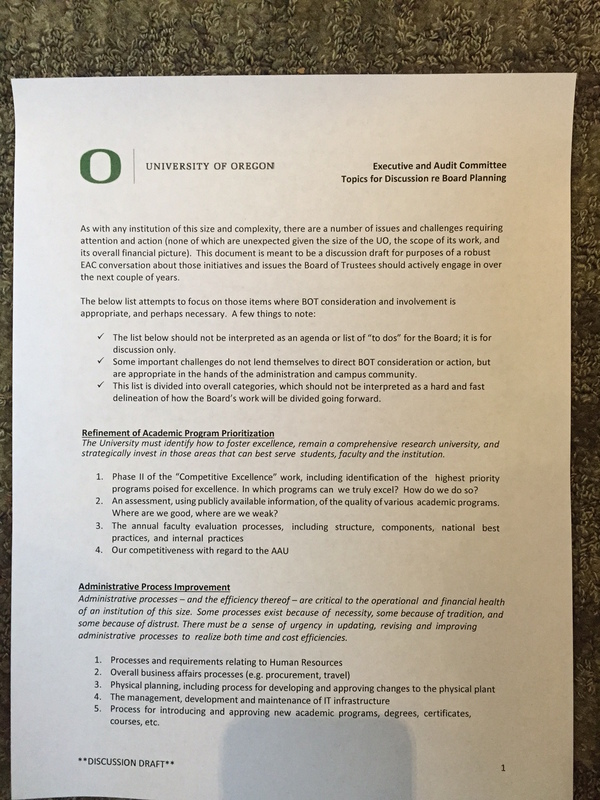 – Board abandons the Triplett / Park scheme to supersede the UO Constitution and faculty governance – at least for now. – Board Chair Chuck Lillis presents draft plan for how the board can take pro-active steps help improve UO’s academic excellence- including improvements in administrative efficiency, fundraising, etc. – Board moves forward on the Sports Product MS program. As much as it pains me to say it, this program probably makes sense for UO. Of course Jim Bean, our former provost and new $250K Sports Product program head, skipped the meeting. Having heard Bean talk many times, I can say that this was probably also a good idea. Two minutes of Bean would have killed its chances forever. – In the committees, starting 10AM Wednesday: A new Duck sports marketing deal, audited financial statements, Jim Bean’s sports product design sinecure, and Coltrane’s presentation on how he’s replacing Senate committees with his own “Administrative Advisory Groups”. – In the full Board meeting, starting 8AM Thursday: Public comment on the Lillis motion to replace the UO Constitution and the UO Senate’s role in faculty governance with top-down control by the UO Board and its UO President, followed by a vote by the board. Update: The faculty has now been promised that this motion is off the agenda. The committee meetings are all in room 403 of the Ford Center, and the full Board meeting is in the first floor ballroom. The list of UO Board Trustees is here. It will be interesting to see if Chuck Triplett uses the support staff tables to form a defensive wall between the university community and the board members, as last time. The “Agenda” links below go to the docket material. However these dockets are not completely trustworthy. At the last meeting Board Secretary Angela Wilhelms did not post the most interesting parts of the dockets, e.g. Chuck Lillis’s power grab on presidential hiring authority. Even the board members didn’t get that until just before they were forced to vote. This secrecy led to confusion and embarrassment for the UO Board, as noted in this InsideHigherEd report by Ry Rivard. This time I notice that the audited financial statements and the auditor’s report are not posted. The docket says they’ll be distributed at the meeting as hard copies, so no one has a chance to read them in advance and ask tough questions. I’m no CPA, but an auditor might say that this sort of lack of transparency “raises a potential matter of concern”. Room is almost full. Seats for “designated media” but I’m sitting in the back with the bond boys. Long discussion of treasury management, internal bank, from some competent bond types. The plan is to borrow on the bond market, pool the funds, distribute through an internal bank. All projects will face the same borrowing rates, reducing uncertainty. Debt will be recycled internally, money in the internal bank will be fungible. Rates are low, 30 years AAA is at 2.7%, but we’re not AAA. Moffitt: we’ll probably be AA. Taxable and Tax-exempt are almost identical, and as we learned with the Arena scheme taxable is “more flexible” in that you don’t have to show a credible revenue stream for the project. Karen Lavear, the new UO Treasurer, give a very clear presentation with lots of back and forth. Very transparent about all the issues. The state is still selling bonds and making the payments for projects approved by the legislature, about $11M, and also G-bonds where UO provides matching funds, e.g. ERB. Should the university issue $50M in long term debt, to be used for capital projects such as EMU. “Debt is a limited resource” discussion. This will cost ~$3M a year in repayments. Bond rating agencies are waiting for the audited financial statements before setting the UO credit rating, in private in January, it will go public in Feb, then the bonds will be sold. Most of the debt service will come from the student fees that VP Robin Holmes manipulated ASUO into voting for. For tuition and fees, up less than expected last quarter, apparently because of enrollment drop and fee remissions for MS programs. (I’m guessing she’s put the subsidies for her husband’s law school in that box too.) PERS costs will go up about 9-10% next year. Very thorough presentation from Moffitt, as usual. And all the numbers are in the docket, link above. This one has already been executed, All contracts over $5M must be approved by the board by next meeting. Exciting opportunity with the bowl-games coming. Firm is hard at work signing up retail partners. Would like to see 25% growth this year, then double. About $4M now. Q: What about local businesses? All agreements stay in place as is. Moffitt: This is about the secretive Tuition Fee Advisory Board, controlled by the admins, which makes recommendations to the board. If you ask for their public records, Dave Hubin will try to fend you off by charging fees. Shelton and Holmes talk about how the students make fee recommendations. Goal is to get it done by March, for new students. This resolution makes changes to the Incidental Fee process, which is historically and legislatively the right of the recognized student government to determine. We ask that you amend this document to remove any such changes and affirm the right of students to determine their own I-fee. 1. The second Whereas statement must be amended to state that the Board may review or refuse the incidental fees recommended by the University President and the ASUO only under the circumstances which are outlined in ORS 352.105(2). We also ask that the resolution include a reference to ORS 352.105(5), which explicitly states that “Mandatory incidental fees are not subject to ORS 352.102” or any of its subsections. Park says no. 2. The last paragraph is extremely vague in regards to how “sufficient time” is defined and the determination of the timeline is completely taken out of students’ hands. We ask that these references be modified to say that any deadlines listed in this document will be created in consultation with the ASUO President, the University President, and the University Secretary. Board says yes. 3. We ask that an extension and appeals process be included in this document, and that this process be created in consultation with the student government. Park says no, this is up to the HECC. 4. The “report” outlined in this paragraph changes the current I-fee recommendation process, and thus violates ORS 352.105(5). The statute referenced (352.102(3)) requires that the joint I-fee recommendation be submitted to the Board of Trustees. It does not mention an additional report or “analysis” of the fee process, and we ask that this section be modified to reflect the existing process, or that it be removed entirely. Any changes made to the incidental fee process must be made with the involvement of the ASUO. a. The current process assumes that unless a specific disagreement arises, the ASUO-recommended incidental fee will be approved by the University President and transmitted to the Board for their approval. 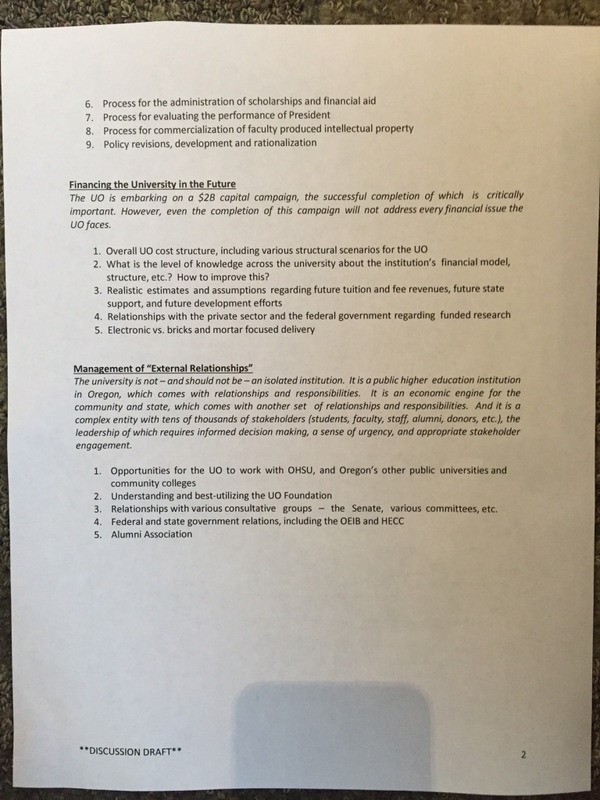 What is written in this resolution requires students to justify their incidental fee recommendation in advance, before any dispute has arisen. We are opposed to this. b. This “report” also adds details (section ii, iii, v) to the written I-fee recommendation that are not in the current process. If the Board of Trustees is going to justify their resolution based on Oregon law, then they must follow Oregon law and not make any changes to the incidental fee process without the involvement of the ASUO. Park: This is already the intent of the motion so these changes aren’t needed. Lamar agrees. 5. We ask that the last sentence be removed entirely, as this is a blatant change to the current incidental fee process, and thus violates ORS 352.105(5). Historically, the power to submit an independent recommendation to the Board has been given to students and we ask that it remain with students. Giving this authority to the University President is a drastic change to the incidental fee process, and the Board of Trustees does not have the right to make such a change without the involvement of the student government. Park: I think we’ve resolved this, the intent is not to usurp the ASUO’s ability to appeal fees to the HECC. Wilhems: we could add sentence noting ASUO can file a dissenting report to the HECC. We ask that the Finance and Facilities Committee amend this resolution to include all of these changes or to vote down this resolution entirely. As it currently stands, this resolution makes deep and lasting changes to the incidental fee process, violating Oregon law and usurping the right of students to determine their own incidental fee. The Board of Trustees had pledged transparency and accountability to the University of Oregon community, and we ask that it prove itself now. From my quick read these are about changes in the policy that would take some powers away from the students and give it to the UO President. Park notes conflicting rules. All in all, an impressive performance by the students, leading to improvements. The buzzwords fly. Bottom line is a new $50M 500 bed dorm, financed by debt repaid with housing fees, which will keep students out of the private market, on campus, and improve retention. Lillis: UO inherited 849 policies, some irrelevant or obsolete, needs to clean them up. The Board is working with the Senate on a plan to do this. Coltrane: I am asking the Board to take the Triplett/Park motion off the agenda for this meeting and then work cooperatively with the Senate on the process for new policies. Lillis: What’s the process to get to a process by March? Coltrane: I think there are no objections to the silliest 67 policies? Lillis: Dropping those will still be on the agenda. 4. Audited yearly financial statements [Nope, not included in the docket.] They are now passing out paper copies. 42 glossy pages, but they can’t post a pdf? My notes – full disclosure: I’m an economist, not an accountant. I’ll have more on this later, after I’ve digested the statements. Moffitt does her usual credible job, while spending a lot of time trying to to achieve the right balance of “everything is on track” with “we don’t have any money”. Note the big revenue bump from “a building we were given”. Hmm, what could that building be, and why can’t its name be said in public? PERS costs will increase by 9-10%, or $7-8M, and that’s assuming the state wins the lawsuit. A $7.2M payment for “deferred compensation” monies from the UO Foundation to UO? For coaches and central administrators, I’m guessing. (Interestingly, The UO Foundation’s independent auditors didn’t detect this problem.) Move it along folks, nothing worth seeing in this year’s report either, I’m sure. “UO’s financial statements are materially correct. You have a clean audit report. Keep in mind that since you are now an independent institution, next years audit for federal compliance will be substantially more thorough, lower threshold for significance. Highlights the $7.2M executive retirement payment from the Foundation to UO. Issue is a conflict between the accounting standards they use. No issues with UO’s internal auditor or her processes. Lillis: The board has private meetings with the external auditor to make sure they’re not being pressured. It’s impressive to have a first clean audit, and “no significant discrepancies”. Good job to Jamie for leading this. “Go Ducks”, Committee accepts report. Well presented, easy to follow. New, hiring staff. On Fraud and Ethics Hotline: Four complaints filed and investigated (including mine on the Triplett hire.). No findings to report. Review of Athletics controls will start soon. Lillis: Thanks, you’re off to a great start. Independent auditors are also impressed. Coltrane gives LeDuc a shout out for his great handling of matters related to the GTFF strike. “Addresses risk from the cradle to the claim”. Reduce effect of adverse events on the performance of the university’s mission”. He’s a former ice climber, he’s not into mini-max. He’s not even risk averse. That’s right, he’s got an affine utility function: u(x) = a + bx. Cool. There’s a process to evaluate risk for each UO unit, then ask about controls needed. Someone should ask for those docs for the athletics department, and of course PLC’s earthquake vulnerability. Ralph: “So you go around wondering what’s the worst thing that can happen on campus today?” LeDuc: Yup…. Lillis: We’ve been a board for a year. We need to step back and think about the responsibilities of the board and the administration without giving up on shared governance? Point II is “Administrative Process Improvement”. I’ll take the optimistic view that Lillis realizes that UO has some serious administrative problems. But maybe that’s wishful thinking. We’ll see. The trustees then have a long serious discussion about improving UO’s academic standing. Very heartening. It would fantastic to see the Board work with the faculty and cooperative administrators to move UO forward. It would be a sea change. It would be what we hoped to get from this “new partnership”. Kurt Willcox introduces a motion dealing with the Board’s responsibilities during future labor actions. It would require the board to be kept informed in case of a potential strike, and in case of impasse to be shown both sides last best offers. Makes sense, given how badly the administration botched the GTFF strike, and how damaging it has been to UO. Lot of buzzwords. Sorry, no live-blog. Coltrane: Connie Ballmer has already funded the obesity and heroin addiction cluster. Applause. Internal funding for 1 or 2, looking for federal money for others. Coltrane: Yes, we just lost 2 top neuroscientists. We tried to retain them. “We often can match the salaries” but the lab cost is higher. New retention program. We are trying to be more nimble and support profs before they get a real offer. Spousal hires. We really only pay attention if they have a offer from a better university. Jim Bean doesn’t even show up to collect his $250K sinecure. Bronet presents it to the Board Committee. Tagged Bond ratings, Governance, UO Trustees. Bookmark the permalink. Trustees have expressed that they have been having trouble sleeping at night. Not to worry, we have a plan that can help with that. Trustees should make no mistake that their primary role is to look under their couch cushions and scrounge up a billion dollars for us, without strings that impact our academic excellence. It’s only a billion dollars, that’s half of what some other basketball teams cost, and we’ll even throw in a free football team. If the trustees really want to do good they can even pretend to Tivo a women’s volleyball game once in a while. Trustees have one of the only jobs in the world where they can be readily replaced by someone older, richer, and less attractive. For most of them, their only necessary qualifications are having graduated from the UO and being rich. We have extremely high expectations of them, otherwise their terms will be expiring soon. Trustees should know that work at the University involves shared governance. They’ve been on the job a few months now, so they shouldn’t pretend like they know how to run this University without us. We have English professors that will correct their bad spelling and grammar. We have legal experts that will give them valuable second opinions, because maybe that’s a good idea when making major decisions about a multi-billion dollar enterprise. We have philosophers who will guide them when they are lost. We have janitors who will clean up their messes. We have administrators that are tired of this bs. We are the University, and just because we are poor, doesn’t make us desperate. If the only way we can get their donations is by destroying our academic integrity and shared governance at this University, then we don’t need their money. Now that I’m sure the Trustees have been lulled to sleep from all this babbling, here’s something to wake them back up. If they try to weaken the academic standards of this University, we will unionize the football team. Thanks for listening. If Scott Coltrane’s conscience is this cynical and confused about why involving faculty in university governance is a good idea, it’s no wonder the board is too. The link to the trustee’s meeting agenda is down. Wondering why. Does anyone have insight into how the Thur 8 am public comment period is being organized? Has anyone requesting to comment via email (as per the trustees’) site heard that they will be granted comment time? Or will we just be notified on the spot that morning as our name is called out from the podium? I am sure they received more Email requests than there will be time for. I was notified that I’ve been given time. That sounds much better than being given timely notice. Those who have been given time might consider ceding the floor to one of our well-spoken colleagues who has taken leadership on this and really explored the issue (Freyd, Dreiling, Bonine). That was going to be my plan if they gave me time. But this just a thought in the interests of being strategic with the limited comment time offered. Obviously anyone who emailed in requesting time has something important to say (so don’t construe this as a criticism if you don’t do that). The University of AreWeGone (from the AAU)? Any chance uomatters will give out any details about the vague new dormitory building proposal ? Is this issue going to be a topic at some of the meetings this week ? Where will the parking lots be ? Will the city sell the UO more streets to close ? The new dormitory studies have been presented at the Campus Planning Committee meetings a couple of times this fall. I don’t know where the Register Guard is getting its information – I hope the information going to the BOT is more accurate. The proposed site is not south of the Longhouse, but on the east side of Columbia Street. More info should eb available from Campus Planning and Real Estate, although I can’t find it on their website. The RG later printed that the church-wharehouse structure was the only structure to be demolished for the new dorm plan. Last week I found Chris Ramey who seemed to explain to me that the houses near the Northwest corner of Moss Street at the 17th intersection will all be moved or demolished also. He claimed there were no designs available for me to see but it sounds like the CPC has been inspecting something. As far as putting things at websites go the most blatant coverup pattern is at the Fairmount Neighbors Facebook site. They did not even post a thing there about the new RG article but they go into great detail about events in the area 100 years ago. UO likes to stack the land use permit process deck by having operatives keep potentially hot issues off neighborhood newsletters etc. Those same people( UO operatives) stack boards like the City of Eugene Historic Review Board. The RG exacerbates in all by playing dumb and downplaying, muddling and oversimplifying the story. Sorry in advance if I missed it, but what capacity does the FS and student body have to challenge the issuance of debt? Glad to see the bond boys do their schtick, but I didn’t see any mechanism to ask why the need for a new EMU? Why are we building more dormitory space when so much off campus housing has gone up? What I read makes it a foregone conclusion that U of Owe is going to keep on putting up things that not much of the student body wants, or actually needs. The ‘internal bank” seems to be bond boy nomenclature for the capture of student loans/tuition as collateral for many of these things. Correct me if I’m wrong…..
Sports product management gets board approval. Some discussion after vote of LCB concerns, Lillis bringing rest of the board up to speed on institutional tensions/history. Item #7 is tabled by Coltrane in the interests of time, will be brought before the committee in March. Ombudsperson was introduced by general counsel, who gave overview of Title IX issues re: mandatory reporting (though tbh I zoned out right about here). Then ombudsperson took Qs from trustees. Blunt Q from Curry re: ombudsperson’s “allegiance”–to students? To admin? He says to the “ethos” of the university. Lots of discussion about sexual assault awareness–can ombudsperson be an office that reports to board about # of assault cases (trends, not specifics, etc). They want data on the sensitive issues. (He’ll be issuing an end-of-year report, will be provided to the Board, might be worth looking out for.) Board votes on whatever confidentiality/compliance thing was at issue, motion passes. Adjourns a little after 5.